4 reasons you should still skydive in the winter. In just over a week, tucked amongst the hills of Western Pennsylvania, a little groundhog named Punxsutawney Phil will peek from his burrow. It is widely believed that what he sees will dictate our future—at least as far as it’s seasonally concerned. You probably know the drill. If this clairvoyant rodent sees his shadow, we’re all in for six more weeks of winter. If not, spring should come post haste. Now, it may seem like a lofty prediction for one marmot to make, but such is his lot in life. Lucky for you, your skydiving fate isn’t nestled in the palms of his four-toed front paws. Regardless of the result, you’ll be fine because at Skydive Paraclete XP you can skydive in the wintertime. We consider ourselves pretty lucky here at Skydive Paraclete XP. Some drop zones are limited to seasonal skydiving. Because we are located in Raeford, North Carolina, we experience fairly mild winters and are open for skydiving operations year-round. A longer North Carolina skydiving season with less limits means more opportunities to get you in the air. Before you join us, here are some things you need to know about skydiving in the cold. The best time to skydiving is on a nice, clear day with calm winds. Honestly, we’ve seen the ideal skydiving weather forecast occurring in the midst of winter just as often as it does in the dog days of summer. There’s just one exception. Lean in close. Here’s an industry secret: if you are looking for a little extra clarity, your best bet is to go skydiving in the winter. Crisp cool air and clear skies mean the views are even more spectacular. Winter’s characteristically cold air cannot hold as much moisture as warmer air can, and the result is increased aerial visibility. While often the distance can seem hazy in the summer, when you are skydiving in winter, you can see for miles! 2. It’s a chill time. We’re not pulling your leg: we’re referencing the atmosphere not the temperature. One of the benefits of skydiving in winter is the more relaxed pace and vibe of the drop zone. Some people enjoy the zippy sprint of a busy summer Saturday. Others are more suited to the deliberate, steady trot of winter business at the drop zone. 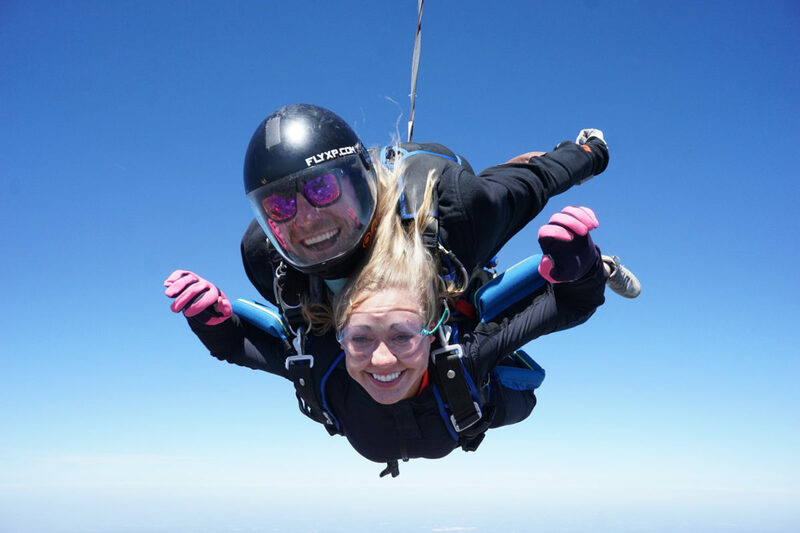 By skydiving in winter, you can avoid the hustle and bustle of the hectic summer season and have an experience that’s more in tune with your chill side. Yes, this may seem like a no brainer. It’s winter after all. But, we want you to know just exactly you are getting into. On the ground, during winter in Raeford, NC, temperatures average in the mid 50’s. While that may not seem exactly polar, please consider the temperature at altitude. For each thousand feet of altitude you gain the temperature will dip about 3 degrees. Take a minute to multiply that out. Brrrr. See what we mean? 4. It’s best if you’re prepared. Despite potentially frigid temps, cold weather isn’t a show stopper for skydivers. 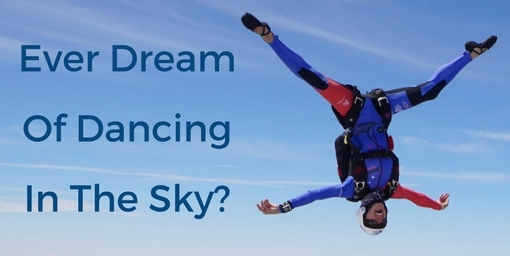 Knowing what to expect is half the battle when it comes to preparing for your winter skydive. Aim to equip yourself with enough cold weather gear to withstand a chill but not so much that you’re a miniature imitation of the Michelin man. We suggest you dress in clothing made from flexible fabrics, wear your low-bulk layers, and don’t forget your gloves! Follow this advice, and you’ll be ready for whatever the winter weather throws your way. Jumping in the winter is no sweat. Don’t worry about Punxsutawney Phil’s prediction, come make a winter skydive with Skydive Paraclete XP!